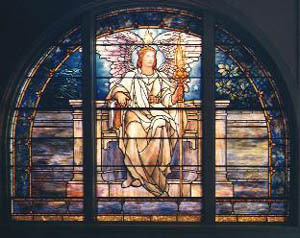 The Harvey A. Andruss Library is very fortunate to have three beautiful Tiffany stained glass windows gracing the building. They were ordered in 1919 and acquired by the Bloomsburg State Normal School (BSNS) in 1920, thanks to the efforts of Prof. O. H. (Oscar Hugh) Bakeless (1858-1933), who was secretary of the Memorial Committee. Professor Bakeless was an 1879 BSNS graduate and served as head of the Department of Pedagogy from 1902 to 1929. He was responsible for soliciting the necessary funds for the windows from students, faculty, and alumni. Click on windows for a larger view. The three windows were made by the Tiffany Studios of New York City and were purchased at a cost of just over $3000, with funds coming from the Semi-Centennial Memorial Fund. The large windows represented Truth and Virtue, with the third window an arch connecting them. The windows were installed in the annex to the dormitory building, later named Waller Hall, and were presented to the school by its alumni on June 5, 1920 to commemorate the 50th anniversary of the first class of teachers and to honor the longtime service of Principal David J. Waller, who was retiring. 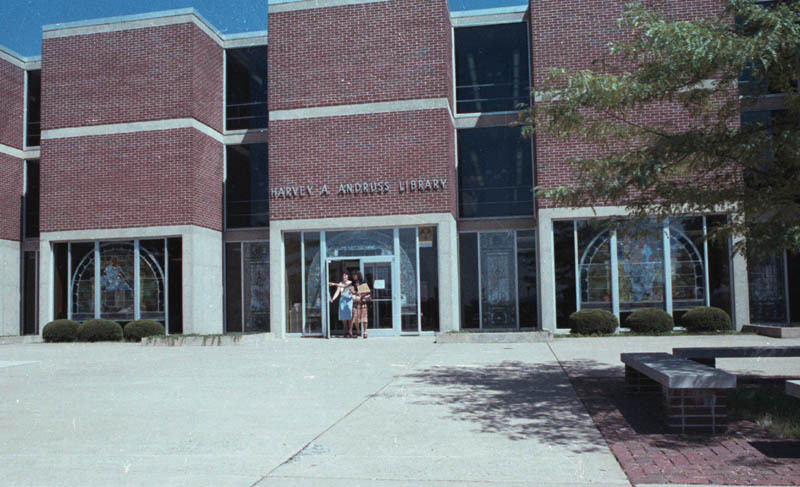 The windows remained in the Waller Hall annex until March of 1966, when they were removed in order to place them in the west side of the Harvey A. Andruss Library which was then under construction. The windows stayed in that building until they were moved one more time to the new library facility, which opened in May, 1998. 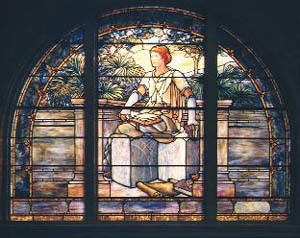 The Truth and Virtue windows can be seen in the front of the Harvey A. Andruss Library on the 2nd floor. The connecting arch is over the doorway to the University Archives/Special Collections Reading Room on the 3rd floor of the building.